After watching the film, which focuses around Queen’s triumphant return to the stage at Live Aid, Indigo became fascinated with the concept of Live Aid and the charity single that inspired it – Do They Know It’s Christmas, written by Bob Geldof and Midge Ure, was a smash Christmas hit in December 1984 and went on to sell 3.8 million copies. In just two hours after watching the film, Indigo, 24, had written the words to her new song, with the music following soon after. This new song, Christmas Wish, resonates back to the original hit single written by Geldolf and Ure, with its big seasonal sound and vocals from Indigo. The theme to this song however is not Africa, but an issue a lot closer to home. 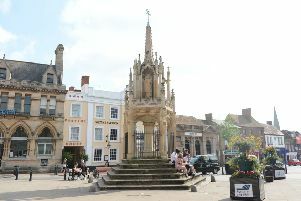 Indigo (whose real name is Gemma Aguilar) said: “I have long been struck by the increasing homeless problem in Leighton Buzzard and Milton Keynes and wondered, like many other people, what I could do to help. > Christmas Wish by Indigo Franklyn will be available to buy from all online stores for download from December 1. All proceeds from the song will be donated to homeless charities in the area.